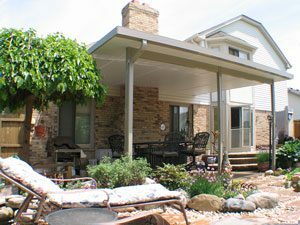 Patio covers are intended to provide shade to make a porch or patio more comfortable and user-friendly throughout the year. That makes them useful for homeowners who want to provide some shelter around their driveway, make the area around their grill a bit more comfortable, or shield their pool deck from excess UV rays. 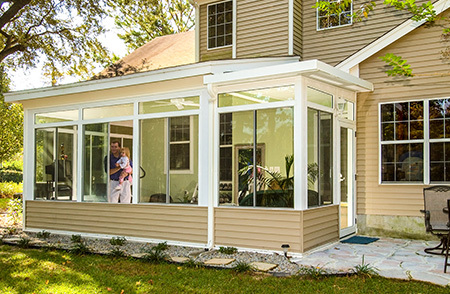 When homeowners in Bear, Middletown, and surrounding areas of Delaware want to improve their homes with patio covers, they can always turn to SRA Home Products, the local leader in selling and installing outdoor structures. 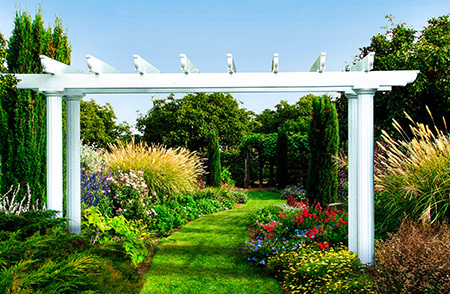 We are absolutely committed to our customers’ satisfaction with every project that we do, so we only offer products from the nation’s largest, most trusted outdoor structure manufacturer – TEMO. Customizable – With several available column styles and two colors from which to choose, homeowners can specify the combination that best suits their home’s architecture and their personal style. Strong – Our patio covers are crafted of extruded aluminum, a material that is stronger than the wood, vinyl, and roll-formed aluminum used for many similar structures. Resilient – The aluminum material is impervious to insect infestation, resists damage from the elements, and never requires annual maintenance. To ensure that homeowners reap all the benefits that they can from their TEMO patio covers, they need to be certain that they can trust their installation team. At SRA Home Products, our team of factory-trained installers knows what it takes to construct an outdoor structure quickly yet effectively. In fact, their attention to detail and insistence on customer satisfaction is reflected by the A+ rating that our company maintains with Better Business Bureau.